What Is Good to Drink After Workout? A good workout is as much about the recovery as it is the activity. After your muscles have endured stress during a workout, you'll need to replenish their glycogen or sugar stores to help them recover. Proper hydration, as well as replacing lost nutrients such as electrolytes, protein and carbohydrates, will help restore your muscles and ease post-workout soreness. While it is important to stay hydrated with water during a workout, too much water can dilute your bodily fluids, so it is important to follow up your workout with a drink that replenishes nutrients lost during activity. Sugar is what fuels the body to move, so replacing it after a strenuous workout is crucial. Fruits and vegetables naturally contain sugars, so a natural juice with not too much added sugar proves to be a good post-workout drink. Juices also contain carbohydrates, electrolytes and amino acids, which help the muscles recover after a workout. Another option would be to invest in a juicer. This allows you to control exactly what you are putting into your body without having to worry about added chemicals or preservatives found in some bottled juices. While water is the best form of hydration for the body, it is recommended that workouts lasting 60 minutes or more be accompanied by a sports drink to avoid exhaustion. Most sports drinks contain both electrolytes and carbs to boost your energy levels and help muscles recover more quickly and efficiently. If you're not hungry after your workout, a sports drink will replace lost carbs and keep blood sugar up to avoid feeling faint. 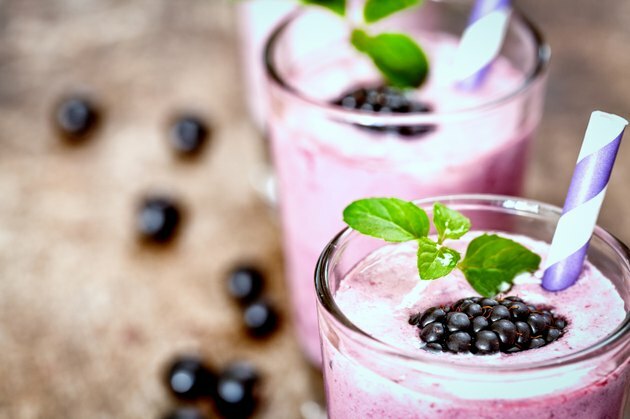 A good post-workout smoothie is a combination of yogurt and fruit. The natural sugars in fruits will help restore glycogen levels in the muscles and replace lost carbs. Most yogurts contain protein and fat, both of which will help repair muscles and reduce inflammation. Fruits high in potassium, such as bananas, are a good choice for smoothies as they help prevent muscle cramping and stiffness. Smoothies are becoming more readily available at most coffee shops and even fast food restaurants, but can also be made at home in your own blender. Because muscles are made up of protein, drinking a protein shake after a workout helps stimulate muscle growth. Muscle soreness is caused by protein degradation after tearing the muscles, so ingesting protein after a workout will help muscles recover to a stronger state than before. Nutritionist Danielle LaFata recommends ingesting anywhere from 15 to 30 grams of protein post workout, depending on the intensity of your session. Protein powders such as maca, soy and whey are readily available at most nutrition stores or even at many gyms. Is It Bad to Eat Wheat Bread After a Workout?